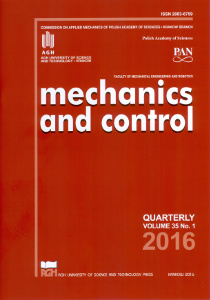 We are pleased to inform that Mechanics and Control is one of the associated journals of the 3rd Polish Congress of Mechanics and 21st International Conference on Computer Methods in Mechanics. The participants of these events are encouraged to submit the full-length papers in the scope of our journal, indicating that they are extensions of the abstracts that have been accepted for the PCM-CMM-2015. An effort will be made to ensure a short publication time, however all manuscripts will be subject to the regular review process.